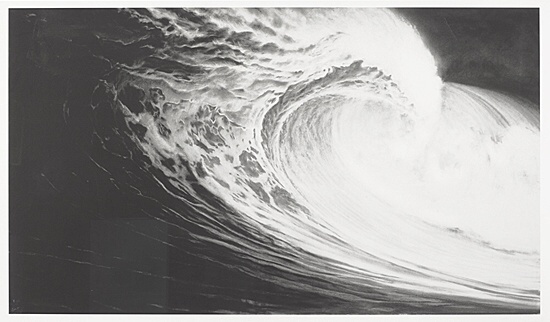 Robert Longo was born in Brooklyn, New York in 1953 and continues to live and work there to this day. Although trained as a sculptor, charcoal drawing quickly became his preferred artistic technique. One can nevertheless feel the sculptor in the background of his drawings, since they have an unmistakable three-dimensional quality. He is a master of chiaroscuro painting and creates significant depth and plasticity through light and shadow effects, giving the works a powerful presence. His ground-breaking series Men in the Cities is one of the most important creations of contemporary drawing. Longo photographed friends on the roof of his studio, who were asked to move about staggeringly, and then transferred the photographs freely into mostly large-format drawings. During the last ten years, he has created several important photorealistic cycles. The selection of themes is political. They have their origin in a reflection on power and its manifestations. The works are reflections on the respective time. Robert Longos works depict atomic explosion clouds reaching into the sky, the breaking of giant waves, fighter planes, but also the heads of tigers and portraits of women in burkas. In his more recent works, he deals with the problems of war, the refugee crisis and terrorism. Like Goya and Sergei Eisenstein, whom he admires and repeatedly quotes in his own works, he looks at the horrors of our time. The absence of colour  most of his works are executed in black and white  underlines the documentary quality of his works. His works have been exhibited at the Whitney Museum of American Art in New York, the documenta in Kassel, the Museum of Contemporary Art in Chicago, the Venice Biennale and the Deichtorhallen in Hamburg. In 2005, he was awarded the Kaiserring of the City of Goslar.